The Dundee Dell was established in 1920 by John Herzoff as the Dundee Delicatessen in a converted one car garage on 50th Street just north of Dodge Street. John was successful and after a few years moved around the corner to 4964 Dodge St. where the business would remain until May of 2000. During this time Prohibition was in effect. However, Prohibition was repealed in the winter of 1933 and John applied for and received a liquor license early in 1934. At that time most of the patrons referred to the business as the Dundee Dell, so John renamed the business and saved a considerable sum on the purchase of a large neon sign. John continued to operate the business as a restaurant and delicatessen until 1940. At that time John sold the Dell to the Cohen brothers, Maxey, Maury and Howard. John moved to Chicago to be with his extended family. The Cohens were alleged bootleggers and had a much different vision for the Dundee Dell. They remodeled the Dell, adding a small stage at the back, a mezzanine above a dance floor and an expanded dinner menu featuring steaks and seafood. During the 1940’s and 1950’s many entertainers traveled from the East Coast to the West Coast via train. These trains came right through Omaha. The Dell became known as the Hot Spot in town with great atmosphere, good food, and quality National entertainment. We know that Blues Master, Willie Dixon played at the Dell and have heard from some of our elderly patrons that Tommy Dorsey played here with Frank Sinatra, but we haven’t been able to prove that. In the middle 1950’s the upstairs mezzanine area was closed to the public as the floor was considered unsafe to hold the weight of a large crowd. This area was enclosed and became an “office” for the brothers. The brothers realized that no one could see into the office, there was a convenient back door also hard to see and therefore no one would know who was upstairs at any time. An ongoing card game was started in the “office”. Sometimes the game would go on for days with people coming and going around the clock. Stories are told about a thumping heard from upstairs, the bartender making a few drinks, taking the drinks through the Red Door behind the bar, returning minutes later with empty glasses, and resuming his job at the bar. Supposedly your wife could be downstairs with her friends and you could be upstairs gambling and she would be none the wiser. By the early 1960’s Howard had died and Maury had bought out Maxey. In the winter of 1962 it was business as usual at the Dell. Maury was playing cards upstairs and the cook came up to report a fire in the kitchen. Maury was known for having no patience, a short temper and a sharp tongue. He told the cook in no uncertain terms to put the fire out and leave him alone. The cook returns minutes later to say that the fire could not be put out, Maury; cursing, said he’d be down after his hand of cards was finished. As Maury went down the stairs the smoke was so thick he could not see his hand in front of his face. Upon entering the main room on the front side of the Red Door. Maury saw his patrons still drinking and eating and the place filling up with smoke. He first called the Fire Department and then went and collected everybody’s tab before he made them leave the premises. As this incredible scene played out, Maury’s card partners never knew anything was amiss until fire axes crashes through the ceiling and walls of their upstairs hide away. Maury had been approached by Neill Everitt several times to sell the Dundee Dell to him. They had been negotiating when the fire happened. Jimmy Cohen, Maury’s son told me about watching snow fall through the holes in the ceiling, when his father received a telephone call from Nell saying he would like to by the place “as is”. Neill became the third owner of the Dell, and as before Neill had a different vision for the business. Neill is a family man; he and his wife Mary Ann have eleven children. Neill was to be found behind the bar taking care of the customers himself. He has strong character and a stronger personality. He is truly a great publican and ran the Dell as a great pub. All his children worked at the Dell, cleaning, cooking, waiting and bartending as they became old enough. The menu was downsized dramatically. Fish and Chips became the Dell’s calling card. The rest of the menu featured hamburgers, sandwiches and other short order items. The stage became a second bar, and pool tables were added. The Dell was the place to be. The business thrived. As time went on and the children started growing up and starting lives of their own, Neill was hoping that one or more of his children would want to take over the business. When his son Jerry was killed in a terrible car/train accident, Neill’s desire for the business was lessened. During the late 1980’s Neill realized none of his children wanted to follow him at the Dell. At this time Pat Gobel was the General Manager at Mr. Toad’s in the Old Market. He had been working in the restaurant and bar industry in Omaha since 1972. Having his own family to care for he was looking to advance his career by buying his own operation. Having heard that Neill might be willing to sell, Pat approached him and they started to negotiate. Pat and Neill immediately liked one another; they were cut from the same cloth. Both were seasoned bartenders with no stars in their eyes about how hard the work of running a pub is. Sales had been declining and the equipment was in pretty rough shape. But the Dell had a wonderful reputation. On April 20th, 1989 Pat Gobel became the fourth owner of the Dundee Dell. His vision was to build on Neill’s hard work and continue to run the Dell as a pub. In a restaurant, customers come, eat and leave. With a pub, customer can do exactly that, and many do, or they can stay as long as they like. They may drink, but don’t have to, they may eat but don’t have to, they may stay at one table the whole time but don’t have to. A pub is the living room of the neighborhood. People come to be with other people, to meet and socialize. The kitchen is open all day and night, not just for lunch and dinner service. A pub is open and friendly. Pat also has a passion for the many different liquors and beers becoming available in Omaha at the time. His work at Mr. Toad led him to Single Malt Scotch and imported beer. At the time of the Dell purchase Pat had 15 Single malt Scotches and 20 Imported Beers. Today the Dell has 692 Single Malt Scotches, the best selection in the Western Hemisphere, and 230 Imported and Craft Beers, as well as 650 other kinds of liquor and about 50 wines. This incredible selection allows the Dell to be unique, not only in Omaha but in the country. With more and more operations opening each day, this selection and the product knowledge of the fully trained staff keeps the Dundee Dell ahead of the competition. On May 13th, 2000 the Dell moved from Dodge St. To 5007 Underwood Ave. The new space was almost twice as big, the ceilings were higher and this location is truly in the heart of Dundee. At this time, the Dell was designed for better workflow, a larger kitchen, bar, restrooms and storage space in the basement. The menu grew to over 100 items, all made from scratch, with the help of Pat’s son, John, a culinary student at Metro Community College. The Dell started hiring other trained chefs which brought the menu to a whole new level. Over the course of the years, The Dell continued to evolve its menu, though the Fish and Chips is still the most popular item. Other signature items included the ”Big Easy”, the Dundee Dell Melt, Fried Pickles and our Reuben made the same way it was when it originated at the Blackstone Hotel in the 1930’s. In the summer of 2016, the torch passed yet again to another well-known Omaha Restaurateur. Greg Lindberg, the founder of Absolutely Fresh Seafood, Shucks Fish House, and Bailey’s Breakfast and Lunch, decided to continue the 80+ year tradition at The Dundee Dell. Along with some infrastructure and cosmetic updates, Greg hopes to bring some “freshness” to the Dell’s menu and intends to re-introduce the Dell to a whole new generation of Omaha diners. 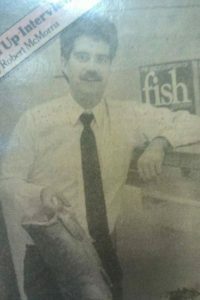 In 1979, Greg Lindberg, hailing from West Point, NE, started driving fresh shrimp and oysters from New Orleans to Omaha in a refrigerated truck, and selling it directly from the truck on the corner of 70th & Dodge. Understandably, people were a little nervous at the thought of buying seafood from the back of a truck, but the word got around due to a quality product at a reasonable price. Customers were the true inspiration behind our name. When asked if the shrimp was fresh, Greg started answering, “It’s ABSOLUTELY FRESH”! After a couple months of this, he painted it on some signs, then on the truck itself, and it stuck. Our loyal and knowledgeable customers asked for more and we expanded our line to include Mahi-Mahi, Salmon, Snapper along with so many more kinds of seafood from all over the world that we took over an old mechanic’s garage at 18th & Leavenworth as a warehouse. Eventually, Greg opened a Fish Market in the front of that building, where our famous Cocktail Shrimp & Sauce and Smoked Salmon were born! In 2002, Greg purchased Sherm’s Seafood Market at 119th & Pacific, where Absolutely Fresh was able to greatly expand its offerings and client base. What began with 2 tables and a limited menu of café style offerings within the market laid the groundwork for the first Shucks Fish House & Oyster Bar when the adjoining space next to the market became available in 2006. It was a bit of trial and error, but eventually our concept caught on which led to the opening of Shucks Legacy in 2008 and Shucks Downtown in 2012. Upon seeing a “Space for Lease” sign at the former Café Café at 120th & Pacific, Greg took over the space and created Bailey’s Breakfast & Lunch in 2007. He created a menu and atmosphere reflecting home-style cooking with a touch of modern flair and just enough seafood. More recently in 2016, Greg acquired The Dundee Dell from its longtime owner in the hopes of preserving an Omaha tradition at a time when many other storied Omaha restaurants had ceased to exist. The Dell has been a staple of the Dundee neighborhood since 1934, and is home to the Wall of Scotch and famous Fish & Chips. With 5 restaurants, 1 Full Service Seafood Market, Catering & Event Services, and a thriving Wholesale Division that provides quality fish & seafood to over 200 different restaurants in the metro area, Greg’s vision has grown into “the real job” that everyone hoped he would find all those years ago. We are proud to be locally owned and operated with over 150 employees – a majority of which have been with us for over 5 years, and some over 20! Our extended family of staff includes siblings, couples, nieces, nephews – even children of our employees. We believe in giving back to the Omaha community that has supported us for all these years (please support our First Tuesday Fundraisers), and look forward to serving you for many years to come.